Now that it’s officially August, I think I can justify starting to think about my fall wardrobe…right? This outfit is the culmination of several pieces I’ve had on my wish list – a sleeveless trench (created by removing the sleeves from an old coat), army green skinnies & cognac pumps. Each of these items is so versatile and are styles I know will be in heavy rotation over the next few months. These heels, in particular, are the ideal color for pairing with fall’s rich hues. Add in the fact that they are real suede, totally comfortable & cost less than $60 – sold! I consider this pairing my nod to the coming season – with layers that are light enough for our current temperatures, but in a palette that’s quintessentially autumn. Although I don't want fall to come around anytime soon, I do love the transition from summer to fall clothing! Great outfit and I love that bag and those pumps are so adorable!! 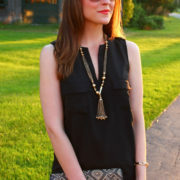 I am wearing a pre-fall outfit on the blog tomorrow too! I'm not finished with summer colors but it's always so hard to not start wearing fall pieces when it's all you can find online & at the stores now! P.S. I LOVE LOVE LOVE those heels!!! I absolutely love this look! It is still too hot in Albuquerque to wear layers, but I have definitely made my wish list. Those are great staples and you pieced them together beautifully. Very pretty outfit! Great shoes and tote! Loving all the Fall like colors – your photography always looks so beautiful and captures every detail!! I am so in love with the structure and color of that bag! I am so in love with the color and structure of that bag! These will be great transition pieces. Your heels are gorgeous. I always have a tough time with suede not lasting because I just don't take good care of them. This is gorgeous! I can't even decide which is my favourite piece as I love your whole outfit. Your shoes are definitely on my top list! omg the sleeveless trenchcoat looks amazing! This is definitely something I could see myself wearing. I have pieces similar to all of these. Looks great on you! Trying to live it up for this last month of summer ~ it always goes too fast!! You're scaring me, it can't be fall yet!!! I loooove this look though so I'm gonna let it slide. 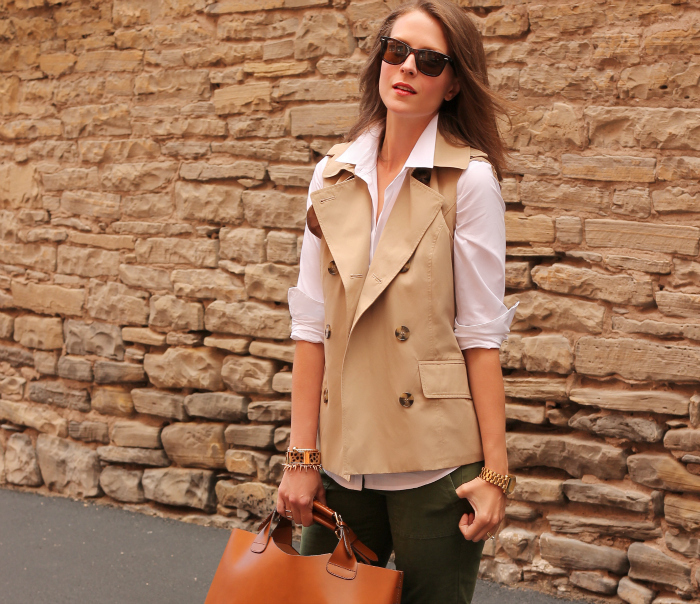 And every fall I dream of a cute trench vest and never get one. This is the year I get one. And a real trench too. Love this classic look on you. Beautiful styling. I hope that you are almost unpacked in your new home and loving it. I love those pants! I can't believe it's August already! Hope you are settling in your new home. If you get a chance, I would love for you to take a look at my segment on our local CW! This is the perfect fall look! It won't cool down here until mid to late October but I am SO ready for fall stuff!! Those heels are adorable, perfect for fall! I have army green skinnies on my shopping list. So chic! Love it all! Unfortunately here in Florida we still have months of hot, humid weather! Ugh. I love fall clothing and can't wait to wear it come November! just found your blog and am loving it oh so much! This outfit is pure perfection and Im inspired. I will be doing something similar soon! Love that lip color. I'm looking forward to fall as well, thanks for getting us in the fall spirit. I love everything about this outfit. And waistcoats/trenches without sleeves are so hot! You executed it all so wonderfully. Hottie alert! Looks like we both had fall on the brain with our latest posts! LOVE your look! Call me crazy but I am so ready for fall! LOVEEEE those pumps! Love this look! 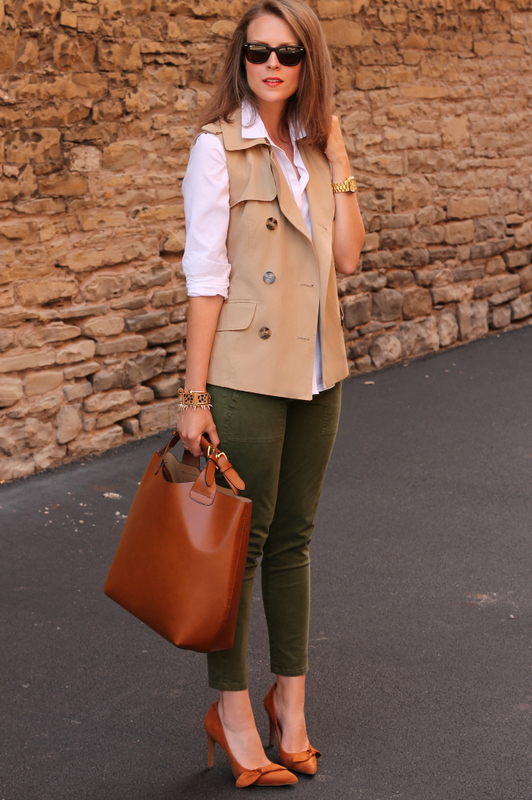 SO chic and that vest is amaze! This is such a great and classic look! Living in Alaska I am already thinking about fall/winter everything! This is such a great look for fall. The color combo is gorgeous, and those pumps are just too cute! 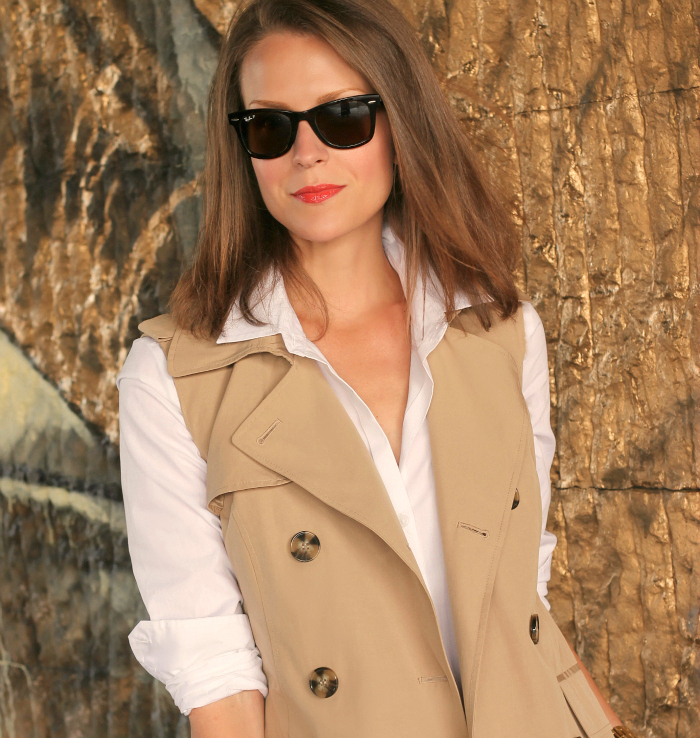 I can't believe you DIY'd this sleeveless trench — such an inspired idea! That tote is GORGEOUS! Love the whole outfit – a great way to take you into Fall! SOOO cute. 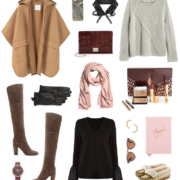 The perfect autumn outfit! I love this pre-fall look so much! The colours are so perfect…this totally makes me excited for Fall!! Cute vest and love those little bow heels! Great fall colors, I am still hanging on to my brights for a little longer! I love the color of your pants and that the vest was a DIY! Very fall and chic. This outfit is so perfect for fall! I can't help but think toward fall but don't want to wish summer away yet! 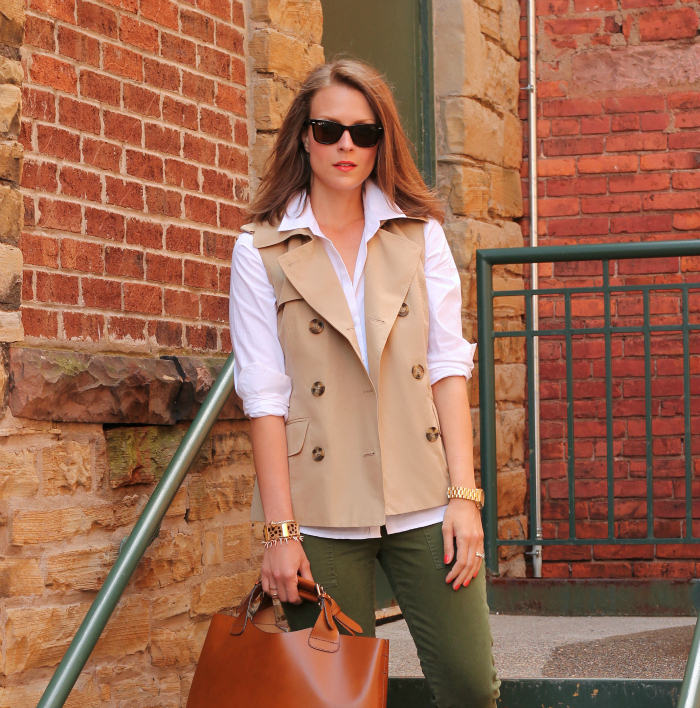 Those pants are definitely going to be joining my wardrobe- they're the perfect fall color! 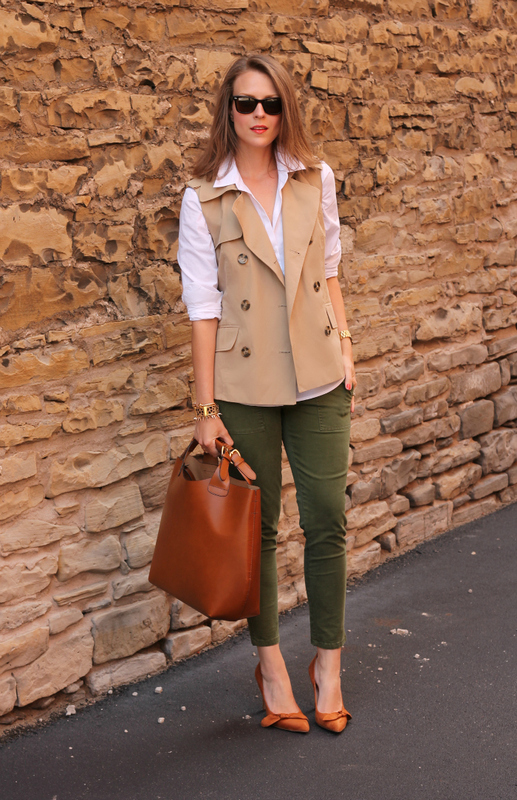 this is the perfect safari outfit for the modern stylish woman, well done! Your hair is gorge and I love the cargo pants!!!!! Your hair is gorge and I love the cargo pants! This outfit is so chic! I like the color combination and your vest is tooooooo die for! I need! Love it! Perfect transition look! so cute! cannot wait for fall! The rest of the outfit is great and all, but I'm about to pee myself over those shoes. They really make the look! You just made me so excited for Fall with this ensemble…lovely lipcolor too!!! Back to school in Oklahoma is fast approaching and with that comes Fall clothing. I absolutely love the pumps! I also must get the Kiss me Coral. I only hope it looks as good on me as it does you! this might be my favorite every look of yours! So chic – love the color combo and layering! wowww cool, love it ….